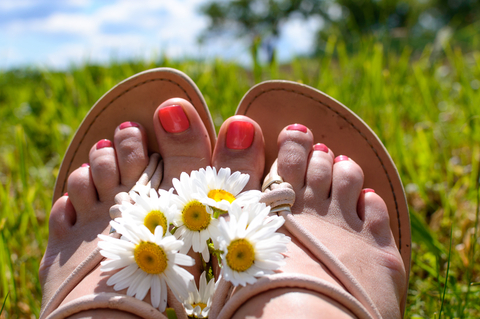 Man or woman, a pedicure is wonderful during the summer There are health benefits—it reduces dead skin that could encourage fungal growth, and tidies up toenails (which if well done, also discourages fungal growth and ingrown nails). And there are social benefits—both men and women, by today’s fashion, should groom their feet before donning sandals or flip flops. But as with anything, if done wrong, there’s a risk. Occasionally, it comes out that some poor soul went to the nail salon only to come out with hepatitis, herpes, MRSA, or another communicable disease. Or more often, contracted toe fungus, causing nails to change color and even fall off. While licensed salons are subject to inspection, that’s limited by the resources available (number of inspectors to number of salons, for example). Fortunately, a little care and self-interest can help you choose a nail salon and build habits to minimize these risks! First, choosing a salon: it’s not actually cost that you should look for, but cleaning and care. A cheaper salon might use smaller, freestanding foot baths. These are easier to clean, and a good sign. Watch for the tubs to be removed to where they can be washed, rinsed, and sprayed with disinfectant after each customer. Fancier salons might use footbaths with a whirlpool or other attachment. These are much harder to clean, and it requires at least 15 minutes to be done properly (since you need to disassemble it and clean inner parts and filters). A good sign salons are doing their due diligence is how they schedule appointments—do they leave enough time between customers to get the job done? Bring your own nail care tools—a good salon won’t think twice about it. Even at home you should wash, rinse, and sanitize nail tools after each use, but at the very least, you’ve only got your own germs. Nail polish is a big one: there’s no sanitizing between clients, and it’s easy enough for fungus to grow. Plus, choosing your own means you can avoid the big toxins used in cheaper polishes. The last big thing is callus grooming. With a metal foot polisher, it’s easy to get micro abrasions. Even if all the tools are clean, those open wounds make contracting a disease easier (even after you leave the salon). Buffers and pumice stones are safer, although they require more regular upkeep of feet since they’re slower. As for cuticles, if they’re mostly healthy, leave them alone. There’s a natural seal that forms and protects nail beds that you don’t want to mess with. (And oiling, rather than trimming, is better for unhealthy cuticles). And note: shaving, waxing, and other skin-irritating forms of hair removal can also create microabrasions that might leave you at risk of infection, so don’t do it right before a salon visit. If your feet or legs develop redness, pain, swelling, or other changes like discoloration (nail turning brown or black) after a visit to the salon, go see a doctor. If you’re a salon die-hard, or even grooming your feet at home before heading out into the summer barefoot or in sandals, make sure that you have some back-up immune support from colloidal silver! Next post: Are You Getting Enough Vitamin D This Summer?